The mood in the European Union on military affairs is undergoing a seismic shift. The Myth of the EU being a project of Peace just died a death. Policymakers across the Continent now say that hard power — long viewed as antithetical to the EU’s raison d’être — is now essential to the bloc’s survival. Yesterday a very dangerous step towards a new military bloc was taken. 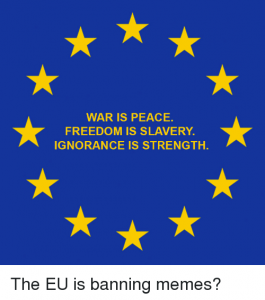 After decades of the EU trying to promote itself as a peace initiative and seeing defense as a matter of national sovereignty now truly aims to be a military power. Trade wars might be fought better with collective muscle, but real wars? On that, the EU leaders now feel its time to invest an flex its own muscle. “The Commission has proposed and parliament passed a €13 billion European Defense Fund for the bloc’s next long-term budget. In the U.K., security cooperation is a cornerstone of Prime Minister Theresa May’s proposed post-Brexit relationship with the EU — one of few British demands that has won unvarnished praise in the rest of the EU. In Brussels, the Commission has proposed a €13 billion European Defense Fund for the bloc’s next long-term budget, in part to expand a list of 17 joint defense initiatives approved in December by the European Council under what is known as Permanent Structured Cooperation (PESCO). The European Parliament has even called for creating a directorate general for defense in the Commission. Juncker’s comments, in a keynote address at a conference on defense and security in Prague, highlighted a new resolve among senior officials in Brussels to push defense spending and cooperation to the forefront of the EU agenda. In doing so, Juncker painted a stark and dark portrait of modern-day security threats, including terrorist attacks on soft targets and an increasingly aggressive effort by North Korea to develop a nuclear weapons programs. He also portrayed EU defense spending as woefully inadequate compared to the United States, Russia and China, and wholly insufficient to meet the challenges at hand. At the same time, Juncker came to Prague as a man-with-a-plan and laid out concrete steps that Brussels has taken, including the creation this week of a European Defense Fund. Macron first proposed the idea calling for a common European intervention force. German Chancellor Angela Merkel has also sounded positive, if cautionary, notes. While initial steps may seem small, experts say they represent a revolutionary shift after decades of inaction. Merkel has cited the sprawling mix of weapons systems across Europe. The proposal was included in a report called ‘Establishing the European Defence Fund’ which was compiled by the Parliament’s Committee on Industry, Research and Energy (ITRE). This committee is formed by politicians from across the parliament. The concept of the fund was announced by President Juncker in 2016 and backed by the European Council later that year. Between 2017-2020, a total of €590 million will be channeled to the military industry through this fund in initial pilot projects. This spending will be totally eclipsed by the proposed increase. The advisory group/ Group of Personalities that initially developed the policy was dominated by arms companies. This Group was made up of 16 members, 9 of which were from arms companies or private research groups. Six of the companies that have already benefited from pilot phase had members on the group. This sets a very negative precedent and will see billions of pounds more of public money being used to subsidise arms companies. The European Union was envisaged as a peaceful project, it should be investing in jobs and research projects that promote sustainable industries and contribute to the prevention of conflicts. Whatever your views on Brexit and the UK’s role in Europe, it should not be using public money to fund research for companies that profit from war. This represents a major precedent for the EU – which had its roots in plans to bring peace to Europe. It has not funded these kinds of projects in the past. Last month, 42 campaign groups from across Europe issued a joint statement to oppose the fund. Cuts in social programmes worth €300 million were needed to establish the Fund. The Connecting Europe Facility, to promote growth, jobs and competitiveness through targeted infrastructure investment, is among the most affected programmes. “The EDIDP will allow for millions of euros to be used in the development of autonomous weapons systems, which can be operated without any human intervention. This is scandalous. There are serious ethical, legal and moral questions associated with these ´killer robots´. This really should start ringing alarm bells with the remainers from the Left that advocate that the EU is a European peace project. They really should see that myth and propaganda it really is! This is how the EU are selling the Arms race!